This is probably how excited Jeffrey Lurie would be if the NFL allowed teams to use more than one color helmet. 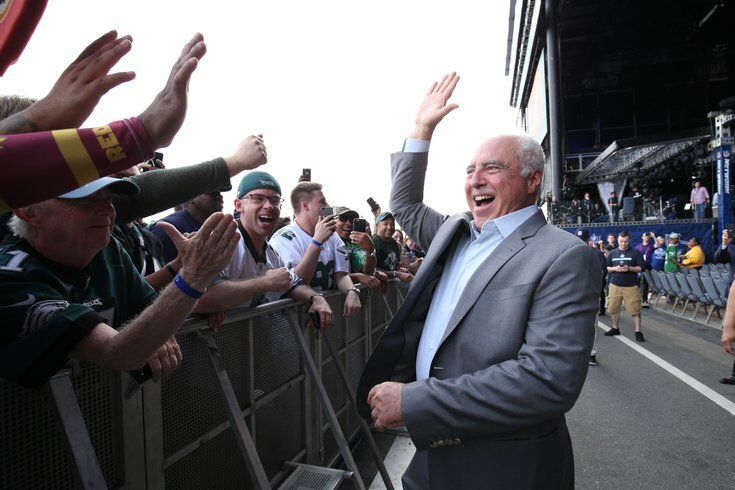 In his yearly press conference at the NFL Owners Meetings, Jeffrey Lurie fielded his yearly question about whether or not the team will occasionally wear kelly green jerseys. And the answer remains the same — Not yet, but it’s not without effort from the Eagles to make it happen, per Jeffrey Lurie. "I was just dealing with this yesterday," Lurie said. "I don't know if I mentioned this last year, but the whole key is that we want a Kelly green helmet to go with the Kelly green jerseys. We're trying to get the league to allow a second helmet. That's where it's at, so they very much know we want this and we want it badly, and we're waiting." Lurie previously said that the hope was that the Eagles could wear Kelly green jerseys by the 2018 season. While he wouldn't rule that out, it seems unlikely. "I don't know," he said. "As I said, I was on it yesterday, and I'm trying to make progress, and we don't have a game for half a year, so you never know." Lurie was reluctant to reveal exactly who is thrwarting the Eagles' efforts to add a second color, or the exact objections as to why it's an issue. So, for now, the NFL remains a "one-helmet league."